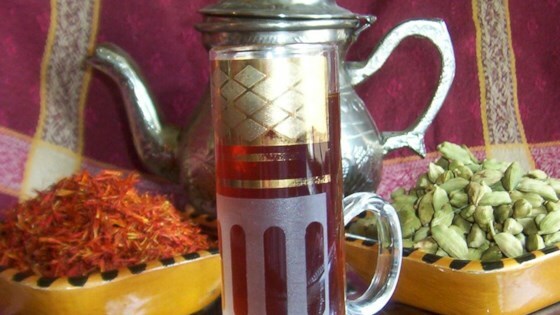 "This is the typical tea you will find in regular housed in Kuwait. Its deliciously aromatic and the spices give it a rich taste." Combine the water, saffron, and cardamom in a saucepan over medium heat. Cover, and bring to a boil. Add tea bags, and let the tea steep for a minute, or longer if you like stronger tea. Strain into a cup, and sweeten with sugar if desired. Not my cup of tea, but not terrible. Finally, a use for all those cardamon pods I have. A wonderful tea. Thanks for the recipe. I found this easy and refreshing. I found Darjeeling tea was good with this, as it's not too strong.